As Christmas approaches I decided to check out how the p-patch garden was doing. The spinach and broccoli are still growing but very slowly. If they survive until Spring I may get a chance to harvest one or both of them. As for the main plot...most everything is covered with leaves and burlap. I trimmed the fuchsia back last month. 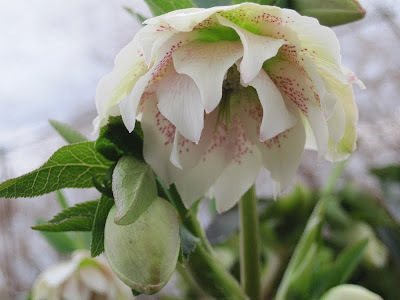 Surprisingly, the hellebores are all showing new growth (see pics below) and are just waiting until the end of January or early February to really take off. I'll probably remove all the old greenery at that time as it's still in pretty good shape (aka minimal black mold spots). Also, the cyclamen coum shows development too, as can be seen in the pic below. 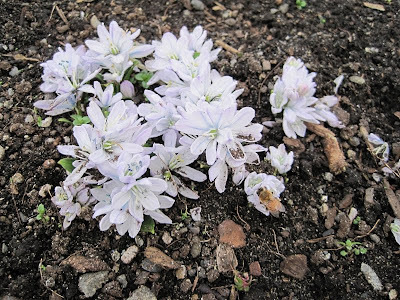 I have high hopes for the perennials this coming Spring which will include: four hellebore, a handful of cyclamen coum, a foxtail lily, countless scilla, and a couple hundred lilies. Swanson's Nursery kicked off the holiday season with a holiday open house last night. There were reineer, shopping discounts, free booze, and hourly drawings. I didn't find anything to spend my money on but did snap a bunch of pics. I found a supply of burlap at Cafe Vita on Capitol Hill at their roaster. The main plot is officially put to bed. Interestingly, my cyclamen coum has sprouted underneath one of the hellebore plants. It won't bloom until next February though. Also, I'll have to prune the fuchsia after the first frost of winter. Otherwise, besides picking some spinach and broccoli, there won't be much to do until next January. Since temperatures have become decidedly cooler, and the rain has returned for the duration, it's time to prep the beds for winter. I pruned the fuchsia and removed the larger call lily from the main plot. Also, I processed decomposing leaves through the chipper/shredder and produced a lightweight, fine compost that I distributing across the plot. What I really need to find now is burlap so that topsoil doesn't blow/wash away over the next few months. As for the second plot...I have broccoli and spinach growing. I've transplanted the spinach evenly across the space to maximize the yield. It should be ready to pick within a few more weeks, depending on the weather. As I write this I think back to how great this year has been for Seattle gardeners. The weather has been consistently warm/hot since early July (although, we could have used some more precipitation). The rats have all but disappeared, or been consumed by a ferret in the garden. And, my crops have produced record amounts of veggies, particularly the corn. On another note, I have planted a fall crop of spinach and broccoli and hope to harvest both before the next hard frost (most likely in late November or early December). I've also planted a bunch of new perenials including: tulips (shown below), foxtail lily, hyacinth, scilla, and camassi. I've removed the summer lily and alstroemeria, and plan to dig up the larger calla lily. The bell peppers are coming along nicely, and I have begun harvesting the first variety of corn ('Golden Jubilee'). The second variety is just recently begining to form ears, and continues to grow taller. I thought my Dicentra 'Burning Hearts' had bloomed and finished a couple of months ago. Fortunately, both plants are making an impressive resurgence. Also, the summer lilies are looking particularly spectacular (and smell even better). Temperatures this July (after three years) are finally back to realistic levels. Seattle has been consistently in the 70s and on occasion the 80's as well. Also, the rain has limited its appearance to every other week rather than every other day. As you can see above, my corn is finally hitting its stride and has yet to blow over from the infrequent windy days. Last year my corn blew over because the stalks were too tall and thin (lack of sunlight). In other news, I've been picking and shelling peas like crazy, and eating the rest. My freezer now has a several-month supply of shelled peas. The cippolino onions were a bust. They got too much water the last couple of months and rotted. I managed to harvest a few that look edible. I'm going to plant some different onions later today that I picked up at Swanson's Nursery. The weather is warm enough by now they should fair better. Temperatures rose above 60 degrees for several days and the corn sprouted. Also, intermittent rain has definitely helped everything along, especially the peas and spinach. The temperatures are cooling off a bit for a couple of days and I hope this will allow the spinach to produce before the warmer Summer weather causes the plants to (inevitably) bolt). Also, in the background, the campanula ('Birch's Hybrid') has bloomed. Isn't May supposed to have rain showers? So far, this appears to be a record month for lack of rain. I've been trying to get out to the patch ever few days to hose everything down. Over the last week, the temperatures have been 60+ degrees and I'm concerned about the peas and beans (they just sprouted). As the pics show (taken last week), the peas are still struggling along, but are finally showing some new growth. Also, I've been harvesting spinach regularly. The onions are looking great. The calla lily plants are looking good as well. The more developed plant has even produced a bloom. This Saturday I'm planning on spending some time cleaning up the plot (removing dead foliage, cutting back the tulips) and planting some corn starts. I need to check out Swanson's and pick up some corn as temperatures are warm enough to plant them. And, of course, more weeding. Thatch grass and fireweed is still present throughout the plot. Well, it looks like the spinach is ready to begin harvesting. Also, the last of the tulips have finally bloomed, and the dicentra 'burning hearts' has sent out the first few crimson flowers. A couple of days ago I began a new compost pile. There were plenty of leaves and lots of grass to build from. Also, I added two bags of coffee grounds from the Ballard Starbucks. Today, I turned the pile for the first time and ended up getting roasted by the heat emanating from the middle of the pile. I replanted another bag of Alderman peas, but many still did not sprout, and a lot of sprouts from the first bag were ravaged by cut worms. As the picture shows above, I have tried to protect the successful plants with mini sticky note tubes to fend off attacking worms. Hopefully, the plants will get better established. Fingers crossed. Finally, I discovered some celery starts a week ago at the Bellevue Nursery. I planted them toward the front of my plot so they will get full sun, and not be blocked by later vegetables (e.g., corn, beans). Well, the weather is still behaving erratically. One day, it will be warm and sunny, whereas on another day it will be wet and cold. Thus, I'll have to hold off on any warm-weather plants. I have planted two separate groups of Alderman peas. I pre-soaked (sprouted) and innoculated these seeds to give them a head start, and covered them all with remay, as the birds will eat unprotected seeds. As the pic above shows, my hellebore are in full bloom, and several of the tulip bulbs from last year have re-bloomed. I'm definitely planning on getting some more bi-color tulips next fall as the crimson ones look absolutely stunning. Also, there are some spinach starts in the background that are beginning to take off. My two dicentra 'Burning Hearts' plants have survived and show signs of green growth. Well, it looks like my broccoli survived Winter. Also, the hellebore is beginning to bloom. Finally, can you spot the honey bee checking out my scilla (2nd to last pic)?